There is very little need for us to convince you that France should be on everyone’s bucket list. It is one of those countries that everyone must see at least once in their lifetime. The lovely small cafes in the streets of Paris where you can enjoy delicious pastries and drink your coffee, the romantic walks in the city of Lumiere, as well as the palaces in Versailles are just a few of Frances’s charms. Let’s not forget about the art of Louvre and Champs Elysees, and the vineyards in Bordeaux. If all that cannot convince you to go to France, nothing will. Before you start thinking of Paris, you should check and see whether or not you need a visa to visit France. What you need to know is that you do not need a French visa, but rather a Schengen visa. France is one of the founding countries of the European Union, and naturally, a member of the Schengen Area Agreement. You do not need a Schengen visa in one of two cases. You either are from a country that is a member of the European Union, in which case you have freedom of movement, or you come from a country that is in the visa waiver program (Annex II). In all the other cases, a Schengen visa is required for all visitors. If you want to find out quick in which category you are, you can take a look at the visa policy of the Schengen Area, or you can use iVisa’s Visa Checker. The button is located in the top right corner of this page. You must choose your country of origin from the drag-down menu on the left and select France in the menu on the right. If you do not need a visa, you will be let know. Otherwise, you will be given a list of the nearest embassies where you can apply for a Schengen visa. Now, you are not required to necessarily apply at the nearest French embassy for a Schengen visa. Of course, if your only destination is France, then naturally, you must visit the nearest French embassy. However, most people travel to more than one European country, in which case the rules are slightly different. As a result, if you plan to visit multiple states that are in the Schengen Area, you need to apply for your Schengen visa at the embassy of the country which is your primary destination. If that cannot be determined, you need to submit your application for your visa at the embassy of the country you visit first. So, if you plan to go to Germany and then to France, the visa that you get from the German embassy grants you entry in France as well. 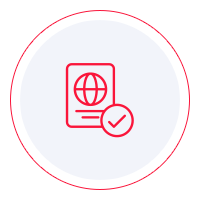 iVisa does not process Schengen visa applications, but if that ever becomes possible, we will do our best to provide the smoothest application process you will ever go through. In the meantime, we hope that the information above is of some help, and if you have any questions, please feel free to contact our support service. It is entirely free of charge and available 24/7.